Transformers! More than meets the eye! Transformers! Robots in disguise! Autobots face their battle to destroy the evil forces of... the Decepticons... umm where was i? Oh yes the review.. well on with it then! 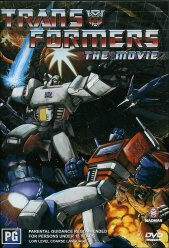 The Transformers were a cartoon and toy series from the 1980's and what even as a teenager, I thought to be really cool. You could take this truck and with a few clicks and snaps the toy had become a robot ready to take on and defend the universe. Great stuff. Whilst suited more toward a younger audience, I got a real kick out of this movie. The story behind it doesn't stretch the grey matter too much either, making for some very easy viewing. There are good and bad Transformers (Autobots are the good guys and the Decepticons are the baddies) who are in constant struggle to either maintain balance on both the Earth and their own planet Cybertron depending on which side of the coin they spin. The battle has finally spun out of control and Megatron and his Decepticons look like they are going to finally rule supreme until a greater menace than either army opposes them: Unicron, devourer of Worlds! This forces the two groups together to fight the greater evil. Another thing that surprised me were the actors who did some of the voices for the movie that included: Orson Welles, Leonard Nimoy, Judd Nelson and Eric Idle. All things said and done, this disc was a lot of fun to watch and a real flashback for yours truly who actually went the whole way and collected the toys and ran around the schoolyard with them. The extras on the disc are a lot of fun to watch as well, especially the TV spots for the toy line and trailers for the movies from different countries. Some of them are very low quality but are still worth the watch. The only thing that disappointed me was that the film was transferred from a widescreen print to a full screen pan and scan, which hit it hard score wise. Things do look a little chopped off in it.